Father and son morticians perform an autopsy on a very odd corpse. This story may have worked more effectively as a one hour episode of a weekly TV anthology series, yet so compelling is it to watch Brian Cox attempt to solve a mystery by cutting into human flesh, I could fully support a 'corpse of the week' small screen spinoff. Norwegian director Andre Ovredal split sides open back in 2010 with his found footage horror comedy Trollhunter. 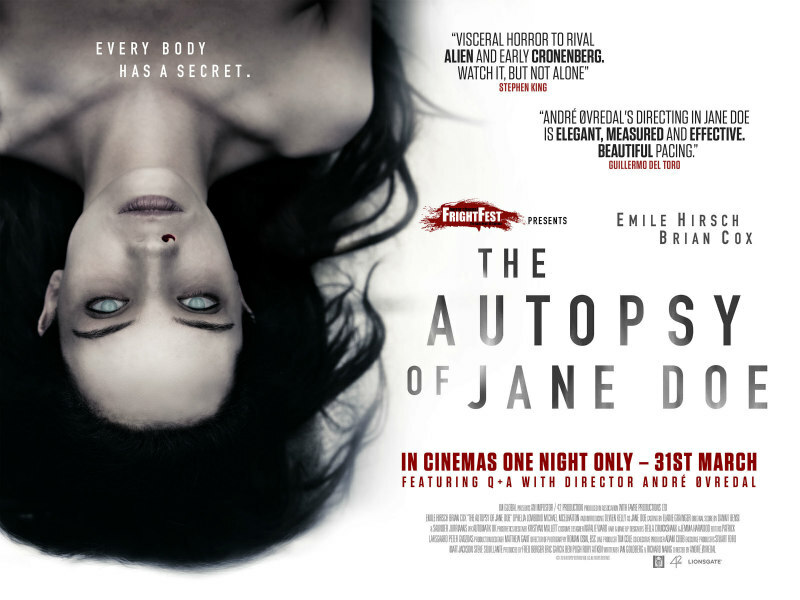 For his English language debut, The Autopsy of Jane Doe, he's largely dropped the comedy in favour of brooding tension, and for the most part the only sides being split open are those of the titular female corpse, played by Irish model Olwen Kelly, who will no doubt be hoping that playing a cadaver kick starts her film career as it did for Kevin Costner following his debut as a stiff in The Big Chill. Most of the action of Ovredal's film takes place in a single location, the family mortuary run by Austin Tilden (Brian Cox), aided by his son Tommy (Emile Hirsch). When the corpse of a beautiful young woman, unidentified and thus designated 'Jane Doe', is brought in by the local sheriff, Austin and Tommy think nothing of it, cranking up the local classic rock station on their battered stereo and getting down to their grisly business. The pair quickly discover there's something not quite right with Jane Doe. They begin noticing little oddities, like how the dirt under her nails is a type of clay not found in that region of America, or how her waist is too small for her frame, as though it's been crushed by an extreme girdle. Things take a turn for the spooky when they open her up to find mysterious scribblings etched into the inside of her flesh. The further father and son delve into their autopsy, the more they realise they're dealing with something science can't explain. Ovredal spins this tale in commendably straight fashion. The only source of comedy comes at the beginning, when Austin and Tommy pull a piece of mortuary humour on the latter's freaked out girlfriend. It's a clever touch on the part of the film, as it relaxes the audience, making later scenes of guts and organs being pulled out of poor old Jane a lot easier to bear - it's just meat, and Austin and Tommy are just doing a job. It's a job they're clearly very good at, and while I'm no expert on autopsy procedures, the script and performances sell the idea that we're watching a realistic depiction of such a process. With so many horror movies relying on their characters to behave like idiots and make ridiculously bad decisions, the intelligent and straight thinking protagonists here are welcome. They employ their knowledge and research skills right up to the point where they realise they're dealing with something they weren't prepared for in mortuary academy. 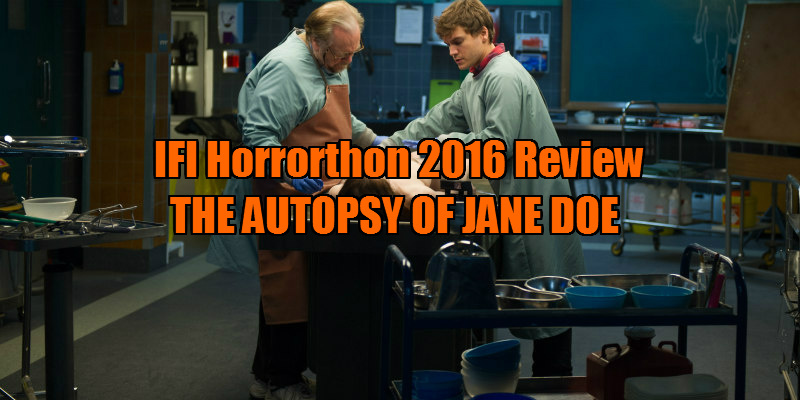 The Autopsy of Jane Doe is at its most compelling during the titular procedure. It's fascinating to watch Austin create a backstory for the corpse with his Sherlock Funeral Holmes type deductions based on minute biological details. It's when the movie kicks into full on horror mode that it becomes less interesting and more generic, turning into a basic, though well crafted, single location zombie movie.